Being healthy doesn’t have to be expensive. 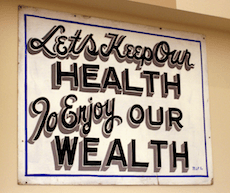 In fact, making health-conscious choices can actually help you save money. It’s a win-win situation as both your body and your wallet will thank you. Here are a variety of ways to keep your piggy bank full and your waistline in check. Coffee shops with baked goods on display often foil the plans of even the most well-intentioned. Saying no to a chocolate donut or blueberry muffin when you need a pick-me-up can be almost impossible. To avoid spending money on these tasty temptations, get baking. Baking muffins at home is much more cost-effective and it gives you full control of the ingredients. Coffee shop muffins are often packed with sugar and even the low-fat versions are typically high in calories. As enjoyable as grabbing a bag of popcorn at the movie theatre can be, the savings that will result from foregoing this crunchy snack can be even more satisfying. The cost of popcorn has steadily increased over the years. Add an overpriced fountain drink and candy to the mix and your hard-earned cash quickly disappears. Instead, pack a small bag of assorted nuts and water. This will satisfy your craving for something salty without breaking the bank. When hunger strikes between meals, you’re likely to buy whatever you can find regardless of cost or healthfulness. In fact, the snack’s health appeal will be your last priority. Aim to never put yourself in this vulnerable position by packing snacks to get you through the day. Fruit, sliced veggies with dip, cereal and trail mix are just a couple of great options. Studies suggest that consumers who shop when they’re hungry will end up spending between 10 and 15 per cent more than those who don’t. Go one step further and shop prepared with a grocery list. Stick to the selected items and don’t impulse shop. Buying a loaf of whole wheat sliced bread and deli meats will last a lot longer (for a lot less) than an unhealthy meal at your nearest food court. Get creative with your toppings and condiments to keep your eyes from wandering. You’d be surprised at how the money saved adds up, even if you only opt to do this every other week. Rather than spend money on bottled water and pop, bring a reusable water bottle with you when you’re on the go. With the one-time purchase, you’ll save money and help reduce our carbon footprint. While it’s fun to buy specially flavoured drinks as the seasons change, the associated cost quickly adds up. Opt to make coffee or tea in the lunch room instead. If you’re worried about a lack of variety, keep your selection varied with a mix of different tea flavours. Try to view speciality drinks as more of a reward for yourself–or a dessert–and make the habit less frequent. These kinds of drinks pack on the calories. Spend your calories more wisely on foods that will actually fuel your body and keep you energized. Crock pot meals, super healthy, super cheap. Super yummy! Definitely agree with not grocery shopping on an empty stomach. It can be dangerous! I love the idea of assorted nuts and water on water bottle. I will insist on this idea on the next movie date with my husband and kids. Anyway, my family has agreed to bring reusable water bottle each time we go put. No to bottled water! Specialty drink? We always have lemongrass tea and lemon or lime in water. I’ve learned that being more aware of our tendencies will help us plan a better day ahead. Especially with food and the kids, it’s a definite must to not grocery shop on an empty stomach.